The Redcat Racing Volcano is an explosion waiting to happen! This hobby grade car is one of the fastest and most affordable cars in the market. It will leave you jumping with joy at its enhanced performance. Its top speed of about 25 mph will leave you rushed with adrenaline in your veins. The Volcano EPX Electric Truck is perfect for hobbyists or beginners looking for a cheap yet efficient car. It comes ready to run and is shaft driven 4WD to help you stay in control. This monster can conquer any piece of land no matter how tough it is. Its monster truck tires allow it to raze the off-road! Worried about the rain? Well, the Volcano has waterproof electronics that allows it to be used in all sorts of weather conditions. You can drive through the slickest of muds and not worry about the ESC getting damaged. The sheer brute force of this car has granted it 4.5 stars out of a possible 5 in our review. So, if you dare unleash the power of the volcano, you might want to know a bit more about it! Read ahead to find out why this car could be perfect for you and what it holds for you ahead! Lightweight, weighing about 8.5 lbs. Long transmission range, about 100 yards. Parts might be harder to find. Low speed when compared to other trucks. Low battery life of about 10-15 minutes. High charging time, up to 3 hours. The Redcat Racing Volcano is equipped with a 19T Brushed Motor that has a heat sink. The 19 turn 540 electric motor delivers an ample amount of power to all the four wheels. The heat sink allows temperatures to be kept safe as the heat sink cools down the temperature. However, since the motor is brushed, it results in much of the heat being lost due to friction. Furthermore, it causes more wear and tear to the motor and so it might not be as durable. The transmission system of the Redcat Racing Volcano Truck allows the user to stay in full control of the car at all times. The transmitter is in the form of a pistol grip radio and can transmit both reverse and forward transmission. Furthermore, it allows you to adjust the steering trim, throttle trim as well as the steering dual rate. The steering and the throttle reverse switches allow for better control over the performance of the car. The range of the radio is over 100 yards. The FCC Approved transmitter allows an interference-free transmission to help you race alongside your friends and family without fear of interference. Also included is a 350 mA charger that allows you to charge the batteries as soon as possible. However, this charger is of inferior quality and hence tends to break apart quickly. You can add some extra Li-Po batteries for even more improved charging and play times. The Redcat Racing Volcano includes a hobbywing Brushed ESC. It allows both forward and reverses speed control with high amounts of torque. This allows better cornering and helps you make the tightest of turns. The Hobbywing ESC is waterproof which allows you to race the car in mud and in rain. It comes equipped with overheat and overvoltage protection. Also included are eight aluminum capped oil foiled coil over shocks as well as an independent suspension system that allows you to race the car over the toughest of obstacles without the slightest hint of damage. It can go over any obstacles without too much impact on the electronics. The dual shock over each wheel allows for longer life of the shocks as well as better damping control. The coiled over spring is a dual rate one for better handling over all types of jumps. Further, the chamber and toe-in can be fully adjusted for better grip and performance. Maximum upper and lower shock mounting position allows custom tuning. The truck is equipped with a Hexfly servo which is a high torque servo. It provides the truck with an ample amount of power to easily navigate the trickiest of turns and the harshest of roads. In addition to this, the servo is waterproof and protects pinion gears as well as electronics from water and other kinds of contaminants. 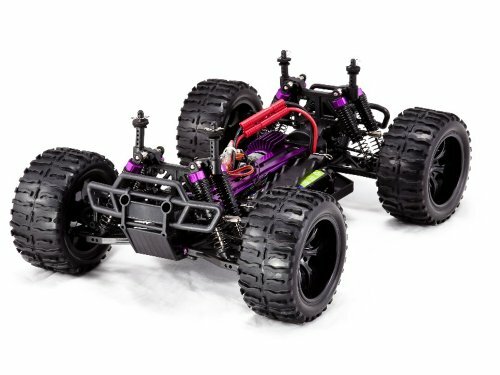 The Redcat Racing Volcano is equipped with large tires, measuring 2.8 inches in diameter. The wheelbase is about 275 mm and provides a large ground clearance of about 3 cm. This means the truck can easily overcome the toughest of obstacles and can conquer any kind of terrain. The car is built with a durable yet lightweight material. The lower chassis is a plastic one while the upper is an aluminum one. The car weighs merely 8.5 lbs. and ensures top-notch durability so you can bash it all you want! One of the most important things to note is how long the truck will last you. It is constructed of a durable plastic chassis as well as an upper aluminum chassis that allows it a long life. The waterproof servo and ESC ensure this car can weather all types of conditions without any damage, adding to the overall durability. The dual shocks over the tires ensure longer life of each shock and protect the internal components from any damage by stabilizing the car and absorbing any impacts. The motor is somewhat durable, however, because it is brushed, it can wear out more easily than its brushless counterpart. The Volcano is perfect for those beginners who are too afraid of speeding along. However, this car hits a maximum of 20 mph allowing beginners to experiment however they want to. Of course, the acceleration is heavily dependent on the batter and charger. SO, you can replace the battery with one with a higher capacity to reach top speeds quicker. The next criteria are how well it performed under the uneven terrain. This is perhaps the car’s most impressive feature as it can maintain speed and stability in the most uneven and harshest of terrains. It is suited for both off-road and on-road. This is because of this large 2.8 inches tires and 30 mm of ground clearance that allows it to go over the highest of obstacles with relative ease. The 4 wheel drive comes into play as well, ensuring you are in full control of the car during these obstacles. This is the criteria by which the Volcano seems to have performed the best. Equipped with dual aluminum oil filled coiled over shocks and a tunable independent suspension, the car can go over all kinds of bumps without damaging any internal parts. Further, you can easily tune the suspension according to your preference. With the high-quality servo, this car handles like a dream. The servo allows you to easily control every aspect of the car’s performance and helps you make the tightest turns. The battery life of the Volcano is about 10-15 minutes which is relatively short. The charging time is however 3 hours. This can be a problem as you would have to wait 3 hours just to play for 10 minutes. You can easily get another battery on backup or buy a faster-charging charger. Now, you might wonder, how well does this car compare with the others? Why this car and not any other? To answer this simple question, we have included comparisons of the Volcano with some of the most popular cars in the RC car industry. Let’s dive right in! The most important similarity between the two is that they are both 4 wheels driven. Both of them can be driven over rough and rugged terrains. The body of the Crenova is made of plastic as well and the play time is small as well. However, the crenova has a max speed of 27 mph, which is just slightly more than the Volcano’s 20 mph. The Volcano has a much better suspension system and its body is more lightweight than the Crenova. The Volcano fares much better in the handling aspect as well! Both of these cars have brushed motors which make for a less durable car. The Rabing’s play time lasts about 15 minutes, quite similar to the Volcano. The Rabing has a control range of 100 yards and so does the Volcano. The charging is, however, quicker at 120 minutes as compared to 360 minutes. However, the Rabing Remote Control Car is a 2WD while the Volcano is a 4WD, which grants superiority to the Volcano. This is because the Volcano allows you more control over each turn and each corner. The Toyen GordVE is a 4WD as well and features a high-quality durable construction. It contains an independent suspension system, much like the Volcano and has a transmitter range of about a 100 yards. However, this car is only suitable for on-road driving. Furthermore, its maximum speed is about 15 mph while the volcano can reach up to 20 mph. The turns are not as precise as the Volcano either. 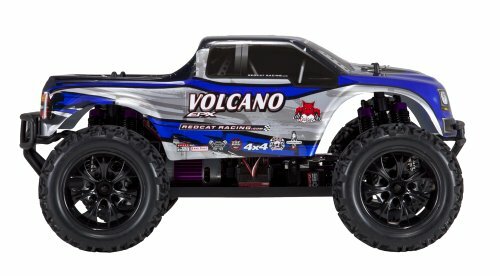 All in all, the Redcat Racing Volcano EPX RC truck is perfect for beginners as well as hobbyists. It might have a low playtime, however, at the price point, who could argue?